I'm pleased to announce that La Musique was awarded the first ever Wonderful Evenings "Seal of Approval!" Both Edge Catteneo and Marissa Lucero were there to present the honor. 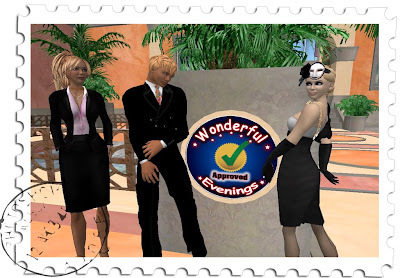 Wonderful Evenings is a series of date guides. Each guide gives you landmarks, pictures and a review of some great places to take a date. The guides may be purchased together or separately. There are vendors scattered throughout Second Life, including one on La Musique that you can check out here.